The purpose of writing announcement of staff meeting is to inform everyone about the meeting. 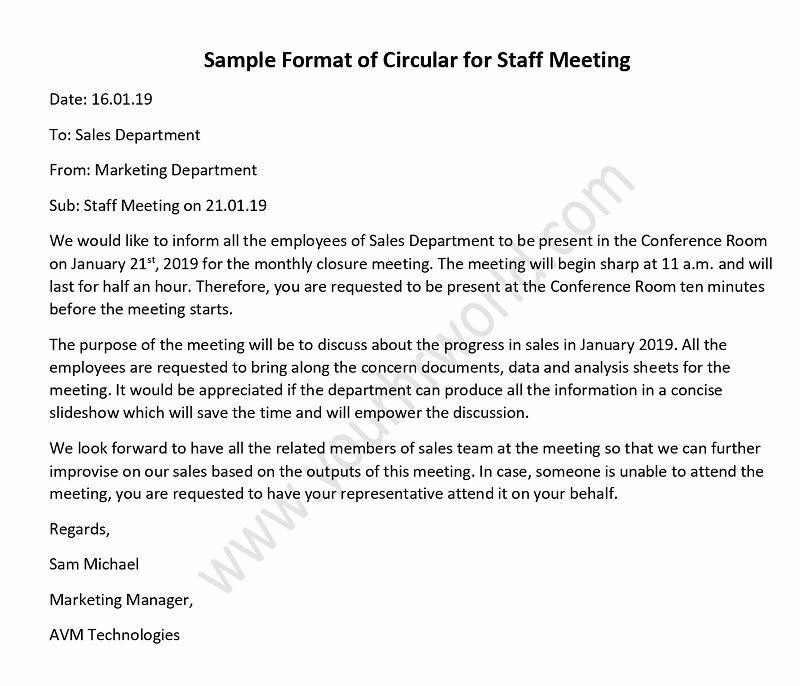 You can use the sample of circular for staff meeting as mandatory staff meeting notice to share the schedule of meeting. The notice of meeting and agenda sample is helpful in keeping the staff informed. We bring the sample of circular for staff meeting for you. Use this sample letter requesting a meeting with employees to create your own. This meeting notice example is an HR circular format for employees. We would like to inform all the employees of Sales Department to be present in the Conference Room on January 21st, 2019 for the monthly closure meeting. The meeting will begin sharp at 11 a.m. and will last for half an hour. Therefore, you are requested to be present at the Conference Room ten minutes before the meeting starts. The purpose of the meeting will be to discuss about the progress in sales in January 2019. All the employees are requested to bring along the concern documents, data and analysis sheets for the meeting. It would be appreciated if the department can produce all the information in a concise slideshow which will save the time and will empower the discussion. We look forward to have all the related members of sales team at the meeting so that we can further improvise on our sales based on the outputs of this meeting. In case, someone is unable to attend the meeting, you are requested to have your representative attend it on your behalf. Hi there would you mind sharing which blog platform you’re working with? I’m going to start my own blog in the near future but I’m having a hard time making a decision between BlogEngine/Wordpress/B2evolution and Drupal. The reason I ask is because your design and style seems different then most blogs and I’m looking for something unique. P.S My apologies for being off-topic but I had to ask!